Located in the scenic White Mountains of New Hampshire at the Attitash Bear Peak ski resort, this well equipped, immaculate, condo offers the perfect location for skiing, summer fun, viewing fall foliage, or shopping at the nearby famous North Conway outlet stores. Ideal for one or two families, this three level, light-filled, end unit looks directly onto the ski slope, with ski in/ski out access. Bretton Woods, Black Mountain, Wildcat, Cranmore ski areas all within a half-hour drive. Short walk to base lodge in winter, or to swimming pools, water slides, alpine slide in summer. Chair lift to summit (winter or summer) provides access to observation tower with spectacular views of Mount Washington. 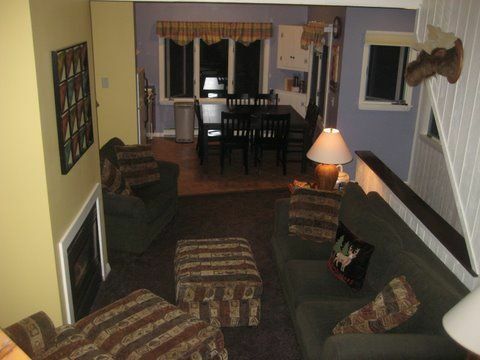 Close to great hiking, Story Land amusement park, and North Conway shopping outlets. Two sitting areas with comfy couches and armchairs. Air conditioning on all three levels. Cable TV on two levels, included. Ski Details: The location could not be better! Sit at the kitchen table and watch the lift begin to run, and the skiers flying by outside the window. Put your skis on outside the back door, then ski a short distance down the hill to the main Attitash Base Lodge, or right onto the 'Flying Yankee' high speed quad chairlift. Ski 'in and out ' for lunch. Walk a few steps up the hill to 'home',following apes ski festivities at Ptarmagin's Pub, located in the main lodge. Matty B's Restaurant and Bar is also located across the street from the lodge. No need to drive anywhere, once you arrive, though there are several excellent pubs and restaurants within a 20 minute drive. Attitash/Bear Peak is ideal for all level of skiers. Plenty of comfortable terrain for beginners and intermediates,with enough challenging trails, glades, terrain parks, and moguls to keep the best skiers entertained. Recently updated snowmaking guns ensure best conditions in the area. Summer Fun at Attitash Resort: Super rental for families or small groups. Enjoy the resort's several indoor and outdoor pools, the Attitash Sports Club (located at the Hospitality Center), tennis courts, Alpine Slide, waterslide park, scenic lift ride to the summit, North America's longest zip line, Mountain Coaster. All are a short walk from the condo. Attitash stables, for ponyrides and trail riding, are a very short drive up the road. Wonderful hikes from the back door, with views to discover and a river to play in across the road. StoryLand Amusement Park is within a ten minute drive. Shopping, cinemas, mini - golf (and real golf), and super eating spots are just south, in the North Conway area. The Scenic Conway Railroad is a nice day out, and the famous Cog Railroad is an exciting experience. There is a train museum , Weather museum, and Mt. Washington Children's museum for kids to explore. The Attitash Hospitality Center has all the information you need to plan your stay, or we'd be happy to tell you about our favorite places, activities, and restaurants. Coin operated washing machine and dryer located in the building. Our unit is well air conditioned in the summer months. This unit is on the end and RIGHT next to the trail. We had 10 guests and we all fit nicely. I gave this 4 stars because the end unit and short walk out to trails trumped everything I had an issue with. I stayed with my family of 8 (4 adults, 4 younger teens) and found it to be a bit cramped, but totally doable. I would say it sleeps 6 adults comfortably or 4 adults, 4 small kids. The third floor bunk room would sleep 4 if the bunk was updated. It was on the rickety side (my 68lb son made it shake while rolling over) the full bottom 100% needs an actual mattress. It's a mattress topper that doesn't fit the full size of the bed making it hard for two people to sleep comfortable. I wouldn't count the sleeper sofa as a bed, it wasn't very comfortable as a sofa, both bathrooms were located on the bottom floor which we thought was weird. The kitchen was tight, but well stocked. Check-in was easy and the place was very clean. Now knowing the layout and what to expect, I would happily stay here again. With a few small updates to some furniture I would give this place 5 stars. The host is very kind and responsive and again the location made up for everything else. Our family of 9 just checked out after an amazing ski weekend. It was so easy to ski in and out between runs to rest and refuel. The 2 living areas were great for our large group to spread out and have space to watch tv, play games or relax. We really enjoyed ourselves. The condo was exactly what my family was looking for! It was perfect to be able to ski in and out all day. We did alot of cooking and enjoyed all the extra items the kitchen offered. The place was cozy and comfortable! We really enjoyed ourselves and would recommend the place. The condo was great for a weekend stay with 4 adults and 4 kids. Being able to use the resort amenities worked out well. We all walked out to the river for a few hours which is a short walk behind the tennis courts at the resort and were able to use both the indoor and outdoor pools as well. This was a last second booking and Alex was very easy to work with. Thank you for the great review. We always love to hear how much our guests enjoy the condo and their stay in the beautiful Mount Washington Valley. This is NOT available as a monthly or seasonal rental during ski season. There is a 5 night minimum during ski season. Cleaning and check in/sports club fees are what it cost us to provide those services with no markup.